DALLAS, TX--(Marketwire - March 4, 2008) - Flipping houses just got a lot easier. Today, Dallas-based MumboJumbo brings the house-flipping simulation game Build-a-lot to the shelves of retailers nationwide. The popular task management game makes its market debut after dominating the online portals since it launched last fall. Developed by HipSoft, Build-a-lot asks players to help local mayors improve their neighborhoods, cities and towns by building houses, improving homes and adding cool features like cinemas, surf shops and castles to drive up property values. By buying new blueprints, flipping houses for quick cash and collecting rent, players work toward financial and neighborhood improvement goals set by each mayor. Not only do players have to balance the tasks assigned, but in later levels players' problem-solving skills are put to the test. In order to complete later levels, players must complete the tasks in the best order to meet the goals within the allotted time. Build-a-lot took online game portals by storm when it launched last fall, ranking within the top five on more than 18 game sites, and ranking number one on Yahoo! Games for the first month after it was released. Yahoo! Users have rated Build-a-lot 4.5 out of 5 stars, attesting to the game's fun factor. While casual games are generally played by a predominantly female audience (almost 74 percent of those who pay to play causal games through online portals are female according to the Casual Games Association), Build-a-lot's unique game play appeals to an even broader audience of both men and women. "We're very proud and excited to bring Build-a-lot to retailers across the nation -- this is a really great game that has given anyone who ever wanted to try their hand at flipping houses a much less expensive way to do so," said Mark Cottam, CEO of MumboJumbo. Build-a-lot retails for $19.99 and is rated 'E' for Everyone. The game is available at retailers across North America and is also available at www.mumbojumbo.com. Headquartered in Dallas, Texas, MumboJumbo LLC™ is a worldwide publisher, developer and mass marketer of premium casual games for PCs and game consoles. MumboJumbo games are downloadable at its website as well as key game portals, or purchased at retail through mass merchants, computer retailers and specialty outlets. MumboJumbo owns and operates studios located in Dallas and Vladivostok, Russia, and publishes and distributes software through its subsidiaries worldwide. For more information please visit our website at www.mumbojumbo.com. Founded in 2002, and located in Redmond, Washington, HipSoft LLC is a leading developer of casual games. HipSoft has developed a wide variety of popular games including Flip Words, Ocean Express, Trivia Machine and Build-a-lot. For more information please visit the HipSoft website at www.hipsoft.com. 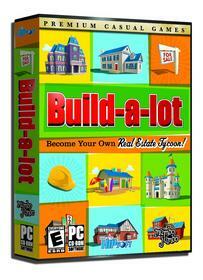 Build-a-lot brings house-flipping simulation game to retailers throughout North America today.